Michael Rakowitz, Unknown from the series “May the Foe Not Stay in Good Health,” 2017. Syrian and other middle eastern packaging, newspaper, glue, 15 x 16 cm. Courtesy of the artist and Rampa, Istanbul. For Frieze New York 2017 Rampa will present works by Nevin Aladağ, Vahap Avşar, Nilbar Güreş, Nuri Kuzucan, Michael Rakowitz, and Joanna Rajkowska. Nevin Aladağ, who is showing works at both the 57th Venice Biennial and documenta 14 (both in Athens and Kassel) this year, makes work that relies on the senses. For Aladağ, the tactility, the structure, and the constructive power specifically of sounds and sights in the everyday world is paramount. Her works—be they installations, video, sculpture, or mixed media—have an acoustic quality or performative element. In playing with color, pattern, and re-appropriation, she aims to reconfigure and contemplate normative sensory instinct, actions, and reactions. Rampa will show a newly produced work from the artist, titled Pattern Kinship (Peace #1), (2017) a work that coalesces and unites the ‘patterns’ characteristic of varied cities into one whole. Vahap Avşar’s “Cumulative Painting” series uses the AND archive, which consists of materials from the eponymous postcard company active in Turkey in the 1970s, now owned by the artist. In their original dissemination to the Turkish public the postcards he uses in this series were directly part of the artist’s life and in turn memory; they were the first images which he painted as a child in rural Turkey. For Avşar, the study and use of the archive is both historic and nostalgic, ideas that run throughout his oeuvre. 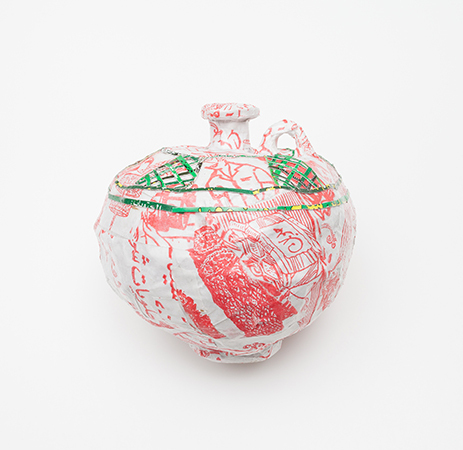 Alongside this will be a seminal sculptural work by the artist, 200 Moneyboxes (1991/2010), a work that, like his “Cumulative Paintings,” is predicated on the ideas of re-appropriation, archive, recycling materials, and the society, economy, and history they come from. In Nilbar Güreş’s collages the background is a stage, full of association (based on color and fabric), and her additions are pointed, but perfunctory and often relate to the dismantling of gender norms and stereotypes of sexuality. The story and the subject are seemingly unclear, but the randomness is always calculated, telling a subtle story. The interest in the associative nature of fabrics shows in any medium Güreş works with. In her triptych Balance, Lifting My Hair, and My Weak Power (2016), for example, she paints and draws figures that speak to ideas about toxic masculinity, effectively queering the fabric she works on, a fabric which is typically used for male’s worker’s clothes. Nuri Kuzucan’s paintings ask the viewer to conflate what they recognize with what cannot be fully understood. They are abstract paintings recognizable as a dense sky-scrapper laden city, but are never based off of a known cityscape. Instead, they reference a kind of collective understanding of what a modern city looks like. They are like Rem Koolhausian delirious cities, something both of the future and of the now. Kuzucan’s interests lie not only in these city scenes, but also in the act and meaning of painting itself. In making visual a three-dimensional space on a two-dimensional surface Kuzucan effectively harkens back to the fundamental questions about painting throughout art history. He does this by questioning and playing with perspective, and by using the cubic formalism of city-architecture to maintain the appearance of both abstraction and forms. Joanna Rajkowska started her Painkillers series in 2014. The series is a prime example of Rajkowska’s specific exploration of ideas around warfare, censorship, and pharmaceuticals, and the many ways these all seem to corruptly coalesce. The works from this series were made of actual analgesic powder (which is in painkillers) and resin, and include exact replicas of an Uzi gun, or a hand-grenade. Rajkowska will be showing her newly produced American Flag II (2017) made from the same materials and with the same underlying meaning as her previous works from her Painkillers I and II series. Michael Rakowitz, who was recently awarded the 2018 commission of the Fourth Plinth in Trafalgar Square, will be showing a selection of new works from his series “The Invisible Enemy Should Not Exist” (2007–ongoing) and “May The Obdurate Foe Stay In Good Health” (2016–ongoing). Both are seminal series by the artist of recreated artefacts made from Middle Eastern packaging and cardboard that were destroyed or looted during and in the aftermath of the Iraq War and the Syrian Civil War, respectively. Rakowitz has often worked with issues relating to forgotten or lost histories, attempting to re-contextualize and renegotiate political and military aggressions under the umbrella of the cultural and social destruction they forebear. For press requests please contact Nicole O’Rourke: norourke [​at​] rampaistanbul.com, T +90 212 327 0800. For full artist bios please visit our website.